3rd March 2012, Oxford Theatre Review. Dennis’ bestselling book, How to get Rich, describes his message just about as well as the Union’s description of this talk does: not at all. 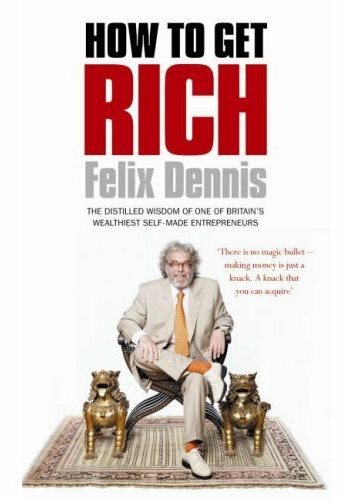 As a multimillionaire entrepreneur, one could be forgiven for expecting Dennis to talk about the mechanics of success- yet where this was mentioned it is only to emphasise that often a highflying life ‘isn’t worth the candle’, and his own ‘good luck’ in surviving it. From the outset, it was made clear that business tips would not be in store tonight, that even the title of his book is laden with irony. Instead, Dennis delivered a talk as much about living with a drive for success as about anything else. He described his life as having three ‘closes’ (an Emily Dickinson reference), which could roughly be outlined as a phase of having very little, a phase of learning his ‘trade’, and a phase of having far too much. He sees himself as living now in a fourth phase, perhaps to be described as ‘giving back’: his writing and charity work are the priority, not business or pleasure-seeking. Yet this rags-to-riches story, delivered in Dennis’ throaty voice, managed to avoid cliché or over-preachiness. He is very much preoccupied with communicating an honesty, a sense of personal truth- in occasional forays into politics or attacks on tax-dodging millionaires, he showed his firm belief that a suppression of honesty, of common sense, is at fault for the failings in today’s society. The part of his own life most glossed over was the growth of his success, the actual making of money. More airtime was given to a childhood without electricity, and the cars and books he owns, than to business: a listener could come away with no idea of the impact or spread of Dennis’ publishing empire. This was very much a talk about the personal impact of success, of how an individual weathered its storm. Dennis cited as his two greatest business strengths ‘talent, and delegation’. But he does not mean the ‘Alan Sugar’ kind of delegation, but a real letting go once your involvement is no longer crucial. The need to keep going, to move past each phase in good time, is perhaps his strongest message about entrepreneurship: he mentioned how experience in larger businesses is a good entrepreneurial starting point, but there are those who simply ‘forget to leave.’ He equally attacks multimillionaires who leave the country, even though ‘England made them’, people who never look behind. He admitted regret within himself that he did not slow down sooner, discover poetry earlier, even start a family- ‘I regret not having begun to plant my forest thirty years ago- there are trees I will never climb because I left it too late’. Engaging and with a fascinating life story to tell, Dennis gave little away about what it really takes to succeed in business but offered an honest take on what it means to succeed in life.